15 February 2017A newly unearthed article by the great politician reveals that he reasoned like a scientist about the likelihood of extraterrestrials, writes Mario Livio. Aged 22, while stationed with the British Army in India in 1896, he read Darwin's On the Origin of Species and a primer on physics. In the 1920s and 1930s, he wrote popular-science essays on topics such as evolution and cells in newspapers and magazines. In a 1931 article in The Strand Magazineentitled 'Fifty Years Hence'1, he described fusion power: “If the hydrogen atoms in a pound of water could be prevailed upon to combine together and form helium, they would suffice to drive a thousand-horsepower engine for a whole year.” His writing was likely to have been informed by conversations with his friend and later adviser, the physicist Frederick Lindemann. During the Second World War, Churchill supported the development of radar and Britain's nuclear programme. He met regularly with scientists such as Bernard Lovell, the father of radio astronomy. An exchange about the use of statistics to fight German U-boats captures his attitude. Air Chief Marshal Arthur 'Bomber' Harris complained, “Are we fighting this war with weapons or slide rules?” Churchill replied, “Let's try the slide rule.”2He was the first prime minister to employ a science adviser, hiring Lindemann in the early 1940s. The science-friendly environment that Churchill created in the United Kingdom through government funding of laboratories, telescopes and technology development spawned post-war discoveries and inventions in fields from molecular genetics to X-ray crystallography. Despite all this, it was a great surprise last year, while I was on a visit to the US National Churchill Museum in Fulton, Missouri, when the director Timothy Riley thrust a typewritten essay by Churchill into my hands. In the 11-page article, 'Are We Alone in the Universe? ', he muses presciently about the search for extraterrestrial life. He penned the first draft, perhaps for London's News of the WorldSunday newspaper, in 1939 — when Europe was on the brink of war. He revised it lightly in the late 1950s while staying in the south of France at the villa of his publisher, Emery Reves. For example, he changed the title from 'Are We Alone in Space?' to 'Are We Alone in the Universe?' to reflect changes in scientific understanding and terminology. Wendy Reves, the publisher's wife, passed the manuscript to the US National Churchill Museum archives in the 1980s. Riley, who became director of the museum in May 2016, has just rediscovered it. To the best of Riley's knowledge, the essay remained in the Reves's private collection and has never been published or subjected to scientific or academic scrutiny. Imagine my thrill that I may be the first scientist to examine this essay. Here I outline Churchill's thinking. At a time when a number of today's politicians shun science, I find it moving to recall a leader who engaged with it so profoundly. 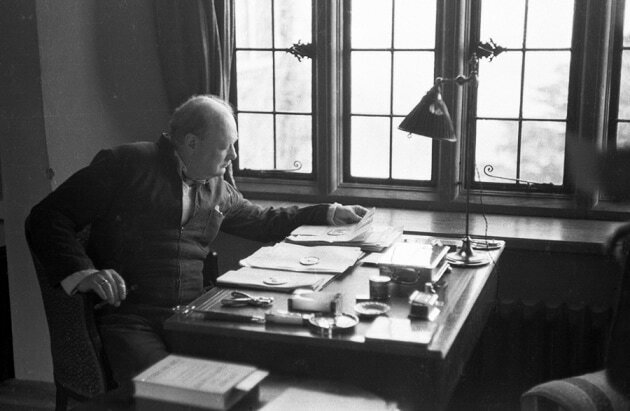 Modern thinkingChurchill's reasoning mirrors many modern arguments in astrobiology. In essence, he builds on the framework of the 'Copernican Principle' — the idea that, given the vastness of the Universe, it is hard to believe that humans on Earth represent something unique. He starts by defining the most important characteristic of life — in his view, the ability to “breed and multiply”. After noting that some viruses can be crystallized, making them hard to categorize, he decides to concentrate on “comparatively highly-organised life”, presumably multicellular life. His first point is that “all living things of the type we know require water”. Bodies and cells are largely composed of it, he notes. Other liquids cannot be ruled out but “nothing in our present knowledge entitles us to make such an assumption”. The presence of water in liquid form still guides our searches for extraterrestrial life: on Mars, on the moons of Saturn and Jupiter or on extrasolar planets (beyond our Solar System). As well as being essential for the emergence of life on Earth, water is abundant in the cosmos. This wonderfully universal solvent — almost every substance can dissolve in it — can transport such chemicals as phosphates into and out of cells. Churchill then defines what is known today as the habitable zone — that narrow 'Goldilocks' region around a star that is neither too cold nor too hot, so that liquid water may exist on the surface of a rocky planet. He writes that life can survive only in regions “between a few degrees of frost and the boiling point of water”. He explains how Earth's temperature is fixed by its distance from the Sun. Churchill also considers the ability of a planet to retain its atmosphere, explaining that the hotter a gas is, the faster its molecules are moving and the more easily they can escape. Consequently, stronger gravity is necessary to trap gas on a planet in the long term. Taking all these elements together, he concludes that Mars and Venus are the only places in the Solar System other than Earth that could harbour life. He eliminates the outer planets (too cold); Mercury (too hot on the sunny side and too cold on the other); and the Moon and asteroids (their gravities are too weak to trap atmospheres). Churchill began his essay not long after the 1938 US broadcast of the radio drama The War of The Worlds (an adaptation of H. G. Wells's 1898 story) had generated 'Mars fever' in the media. Speculation over the existence of life on the red planet had been going on since the late nineteenth century. In 1877, Italian astronomer Giovanni Schiaparelli described seeing linear marks on Mars (canali; mistranslated as canals) that were thought to be constructed by some civilization. These turned out to be optical illusions but the idea of Martians stuck. Science-fiction stories abounded, culminating with Ray Bradbury's The Martian Chronicles (Doubleday, 1950), published in the United Kingdom as The Silver Locusts (Rupert Hart-Davis, 1951). Cosmic outlookChurchill's essay next assesses the probability that other stars host planets. He reasons that “the sun is merely one star in our galaxy, which contains several thousand millions of others”. Churchill assumes that planets are formed from the gas that is torn off a star when another star passes close to it — a model suggested by astrophysicist James Jeans in 1917, which has since been ruled out. He infers that, because such close encounters are rare, “our sun may be indeed exceptional, and possibly unique”. Thus, he concludes, a large fraction of extrasolar planets “will be the right size to keep on their surface water and possibly an atmosphere of some sort” and some will be “at the proper distance from their parent sun to maintain a suitable temperature”. This was decades before the discoveries of thousands of extrasolar planets began in the 1990s, and years before astronomer Frank Drake presented his probabilistic argument for the rarity of communicating civilizations in the cosmos in 1961. Extrapolating data from the Kepler Space Observatory suggests that the Milky Way probably contains more than a billion Earth-size planets in the habitable zones of stars that are the size of the Sun or smaller3. Reflecting on the enormous distances involved, Churchill concludes that we may never know whether such planets “house living creatures, or even plants”. Bigger pictureChurchill sees great opportunity for exploration in the Solar System. “One day, possibly even in the not very distant future, it may be possible to travel to the moon, or even to Venus or Mars,” he writes. By contrast, he notes, interstellar travel and communication are intrinsically difficult. He points out that it would take light some five years to travel even to the nearest star and back, adding that the nearest large spiral galaxy to the Milky Way (Andromeda — one of the “spiral nebulae”, as he calls them) is more than several hundred thousand times as far away as the nearest stars. The essay finishes eagerly: “with hundreds of thousands of nebulae, each containing thousands of millions of suns, the odds are enormous that there must be immense numbers which possess planets whose circumstances would not render life impossible.” Here Churchill shows that he was familiar with the findings of astronomer Edwin Hubble in the late 1920s and early 1930s, who discovered that there are many galaxies beyond the Milky Way (about 2 trillion, according to a recent estimate4). Almost 80 years later, the question that obsessed Churchill is one of the hottest topics of scientific research. Searches for signs of subsurface life on Mars are ongoing. Simulations of Venus's climate hint that it may once have been habitable5. Astronomers believe that, in a few decades, we will discover some biological signatures of present or past life in the atmospheres of extrasolar planets, or at least be able to constrain its rarity6. Churchill was a science enthusiast and advocate, but he also contemplated important scientific questions in the context of human values. Particularly given today's political landscape, elected leaders should heed Churchill's example: appoint permanent science advisers and make good use of them.